AFK for the night. I'll pick first thing tomorrow morning. You could PM me and I could post for you. 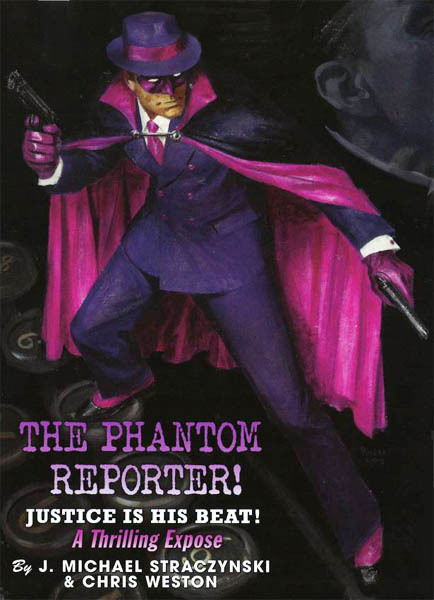 The Phantom Reporter was a journalist who also acted as a costumed 'mystery man' to battle criminals and spies in the 1940s. In April of 1945, when "every allied superpower, every man, woman or half-assed sidekick who had ever worn a costume, had descended on Berlin", Jones was part of a group of twelve previously unassociated heroes who were investigating a secret bunker. The bunker was a trap, and all twelve were captured and placed into suspended animation by a Nazi scientist who was going to study them. Alas, the scientist was discovered, detained, and executed by Soviet forces, and the twelve remained lost in suspended animation until they were discovered over sixty years later. Revived, the twelve adjusted to life in the new century in different ways. One of them, Dynamic Man, found that the future was not what he had always dreamed of, and began murdering those he felt unworthy of 'his' perfect future, including fellow displaced hero The Blue Blade. The Phantom Reporter investigated these murders and discovered that Dynamic Man was behind them. His true nature--he was an android, programmed with all his creator's hopes, fears, and prejudices--and his crimes revealed, Dynamic Man tried to kill the ten remaining heroes and escaped. A small group of them--Phantom Reporter, Captain Wonder, Fiery Mask, and Master Mind Excello--pursued Dynamic Man and confronted him in the lab in which he was created. In the ensuing battle, Fiery Mask was mortally wounded and with his dying breath he bequeathed his powers, which he received from a dying man more than sixty years prior, to Richard. Captain Wonder restrained Dynamic Man, and Richard used his newly-acquired fire powers to destroy the murderous android. And now to BlueCloud2K2 for the draft's penultimate pick! I did not see the Pick coming. In fact, I'm not sure I knew about him until now. neat! I only knew about him because I happened to see a hardbound compilation with J.Michael Straczynski's name on it at the local library and decided to take a look. I really had hoped that these others would make my decision for me. I am stuck between either picking with my 1. heart 2. for points or 3. for power. Ah heck... she did well last time. She deserves to come back, I guess. I love this pick. 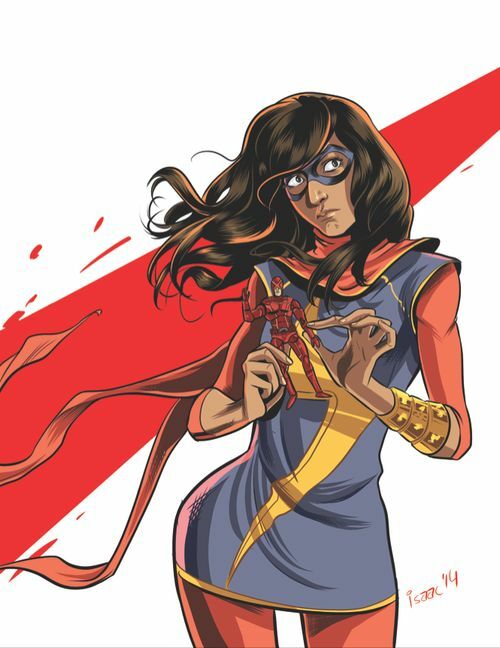 The fact that the picture shows Kamala playing with a Hank Pym action figure is priceless. And I am enclosing another Monica Rambeau picture. I actually just bought that on clearance sale! Looks interesting. Did we skip Rose's pick? I didn't see it, just wondering. I hope you'll enjoy it. I liked it quite a lot. Funny you should ask that. Real life has sidelined The Rose from the game for a bit, but he should return. In the meantime, let's move ahead and keep drafting. Psybolt, go ahead and make your selection. I'll post something for Rose soon, out of order will be fine this time. The final member of The Rose's Monster Mash will be the indestructible swamp zombie Solomon Grundy! And a Bluecloud sighting, excellent! So he's worth a whopping 10 points. Sending PM to Hermit now. Are you stalking me, sir? So, is FISS a thing now? "I have a signal?" Jenni raised a brow in surprise. Of course you have a signal, Jenni. You're a LAUGH star, a big draw, a part of the family! You get an XS signal! "Wow, you really don't want a repeat of the Jaime thing, huh?" So, you coming back? Puhleeze? "Yeah, sure, I guess. Besides, it's the last pick of the last round, not like any better offers are coming around." So I didn't really need the signal? "You're checking how much keeping that thing on costs you, aren't you?" "Hey, that's a lot of points up there. Wait, did you pick me because of the POINTS I got you?" "You know what, just stop before I reconsider this." Can you get the 4-point bonus and the 5-point bonus? I thought it was one or the other. And congratulations to XS, this season's Miss Irrelevant! 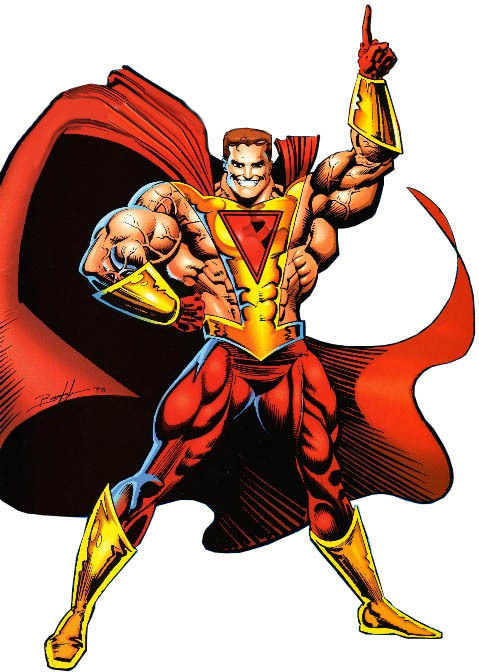 Well, taking the 5-pointer doesn't seem correct, since XS has appeared in both Legionnaires and Legion of Superheroes. She is an official member of the Legion as far as I know. A member of the Flash family is rarely irrelevant, speed force and all that. I did have some runner ups though. 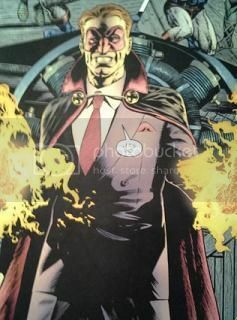 I also considered Lois Lane... who certainly was introduced way back, and is Red Tornado in her current Earth 2 version. Barry Allen himself was one of the guys on the list because anything XS can do, he probably did first. And a few others besides, though by the time it got to the last third of the list I was less worried. I think I took the word 'ongoing' too literally. @ LOG: Sorry about that, Commish. This is correct, you only get one of the three starring-title bonuses. Tell that to Blue Beetle. And I TRIED... Pariah's brainwashed him!